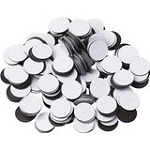 Each adhesive magnet circle is 2" in diameter and 30 mil in thickness. You can use these peel and stick magnets for very lightweight projects, such as with a small piece of card stock or on the back of a paper business card to magnetize it. Magnet Valley provides a secure checkout that is verified daily by Thawte. When you arrive at the payment page you will see the â€˜https://â€™ in your address bar verifying the secure checkout.